Cover Description: Blue Beetle stands over a defeated Booster Gold. Brief Synopsis: Booster Gold and Blue Beetle battle it out in New York City. 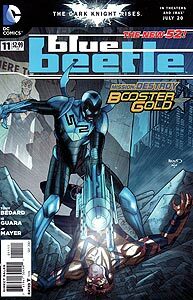 Issue Summary: Booster Gold appears with Thaddeus Miller on Newstime A.M. with Connie Burnett to offer his aid to Blue Beetle. But Booster isn't the only person in New York City looking for Blue Beetle. Brenda and Paco have also come to the city in search of their missing friend Jaime, unaware that he is the Beetle. Elsewhere, Mr. Bones of the Department of Extranormal Operations is also searching for Beetle. Interested in finding a mentor, Blue Beetle travels to Liberty Island to meet Booster Gold. As thanks for his trouble, Blue Beetle is attacked by Booster, who claims that Beetle is the vanguard for an attack by the Reach. Combat ensues. As Blue and Gold fight through Manhattan, Brenda and Paco miss Jaime's grandmother and are captured by D.E.O. agents. Issue Notes: Events in this story take place before Justice League International Annual, Volume 3, #1. MEET THE PRESS: Host Connie Burnett introduces Booster Gold to the audience of her talk show, Newstime A.M. with Connie Burnett, as Michael Carter. Prior to Flashpoint, Booster Gold's legal name as recognized by the United States government was actually "Booster Gold." For years, his birth name "Micheal Jon Carter," was a secret known only to his close friends. PRODUCT PLACEMENT: Booster takes the opportunity of appearing on a live television show to promote his products, "Booster's Best fair trade coffee" and "Booster-Blast energy drink." Booster Gold's talk-show counter-point is Thaddeus Miller, super hero opponent and founder of the Superfail website. At the conclusion of the previous issue, Booster Gold had burst into Miller's office to offer his services. Is Connie Burnett aware that her guests are colluding against Blue Beetle? 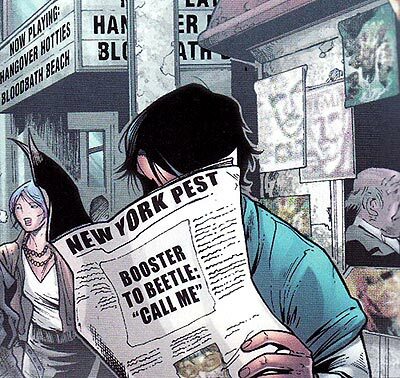 EXTRA, EXTRA: Jaime Reyes is at a newsstand reading a copy of the New York Pest with a picture of Booster Gold on the cover. (Television appearances, product placements, newspaper headlines, all in one issue? Is this a Blue Beetle comic or a Booster Gold comic?) Hanging on the wall behind Jaime in this panel is the cover to Justice League International, Volume 3, #1. Note that it is not the cover as published, but the solicited cover with a mysterious woman in black in place of Godiva. Jaime sends Booster Gold a text from a Moondollar Coffee cafe. Was the Sundoller Coffee chain another victim of the events of Flashpoint? Believe it or not, despite both characters debuting in 1985, Booster Gold and Mister Bones have never exchanged dialogue on panel in a comic book. Meeting Booster Gold for the "first" time at the Statue of Liberty, Blue Beetle makes a joke about gambling on football. While it the public knows Booster Gold's real name, apparently his sordid past is still a secret. In the time before Flashpoint, Booster Gold was responsible for introducing Jaime Reyes to the power of the scarab. Now Booster is out to stop Jaime from using the scarab. What a difference a Flashpoint makes. Loosely translated, Jaime shouts," Virgin of Guadalupe! Why does no one believe me?" The Virgin of Guadalupe, an apparition of the Virgin Mary as she appeared to Mexican peasants in the sixteenth century, is a holy icon to Mexican Catholics. "Not in this lifetime." Obviously, this is a reference to the fact that Booster's best friend was once Ted Kord, the second Blue Beetle. As mentioned earlier, this Blue Beetle and Booster Gold had a mentor/protege relationship prior to Flashpoint. POWER DOWN: This is the first time that Booster Gold has been defeated by a walker cane. Sigh. For the record, "dejalo, gringo" roughly translates from Spanish into, "leave him be, American." Boosterrific Review: Booster Gold comes off looking like a cad, and the bigger story of the trails of Jaime Reyes seems to get a bit short changed (does that kid ever catch a break?). Otherwise, it's a pretty fun issue, with some good art and great Booster moments.